Every day we receive applications of soldiers and veterans in need. FISH fights to help them with every resource we can. Here are some of those heroes we have helped and their testimonials. They are why we do what we do. God Bless. .
FRIENDS, OUR DEAR FRIEND BUDDY THOMAS, PASSED AWAY SUNDAY, NOVEMBER 27TH, IN HIS SLEEP. PVT THOMAS RECEIVED A PURPLE HEART AFTER BEING WOUNDED IN THE BATTLE OF SAIPAN DURING WORLD WAR II. HE WAS SUCH A WONDERFUL FRIEND AND I KNOW EVERYONE THAT MET BUDDY WALKED AWAY BLESSED IN MEETING HIM. HE WILL TRULY BE MISSED. PLEASE PRAY FOR HIS WIFE FRANCIS. My name is Brittany Stewart and I am from Lawrence KS. I came to The Dog Knowledge to train with my new service Dog. I suffer from a TBI and severe PTSD. I have never trained a dog and really have never even walked a dog on a leash and was very nervous. I walked into The Dog Knowledge and it took my breath away. It looked like where Olympic gymnasts train but for dogs. I was greeted by everyone and it is the most amazing place I have ever seen. anything like this place. It is It is absolutely amazing. Thank you FISH(Friends In Service of Heroes) Hyvee and others for funding and helping me find my new best friend. I am a retired Air Force Veteran and was lucky enough to receive a service dog from FISH. Before being paired up with my girl, Lea, I was a mess. I struggled daily to just get out of bed. Any crowded places were out of the question and my anxiety level was almost unbearable. To say the least, my service dog has changed my life. Every morning she is wagging her tail by my bed waiting for me to get up. She never leaves my side. My doctor said my "surge protector" was broken. Since Lea came into my life my anxiety level has diminished tremendously. I am able to go out again without constantly feeling hyper alert and anxious. She is an amazing girl and I can't imagine my life without her. Thank You Paul Chapa and FISH. I could never express to you how much you have made my life better. Thank you, Paul Chapa and FISH. My life has become so much better because of your care and generosity. Five years ago Jonathan's life changed forever when a bomb exploded under him in Afghanistan. The recon-marine lost both legs, a hip and had other severe injuries from the blast. 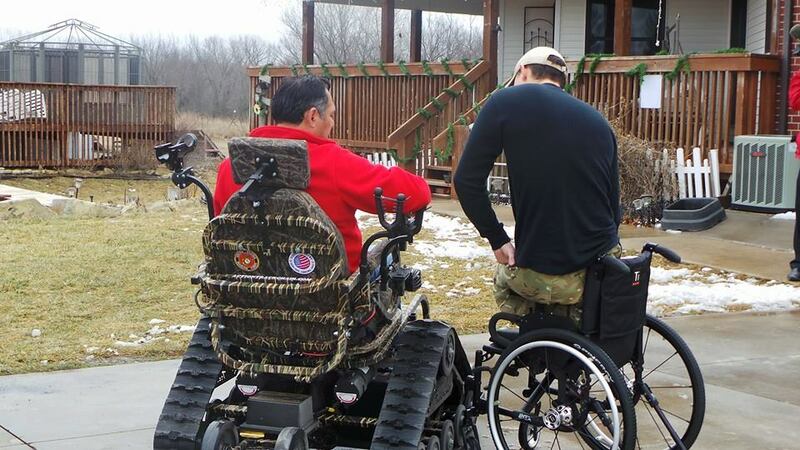 On March 3rd FISH dropped by his home south of Augusta, KS with a brand new motorized chair with tracks on it to give to Blank. Jonathan says, "It's a pretty cool device. I'll find a use for it, for sure. It's going to help me get around and keep me out of the dirt and muck. You know before, I would get trapped with my smaller wheelchair." Blank likes hunting and fishing and he will be able to enjoy the outdoors once again. FISH presented Sgt. Michael (last name disclosed), US Army (ret. ), with a Service Dog on June 18th in Rock Hill, NC. The animal will assist in helping Mike in his day-to-day activities. Mike earned in the Afghanistan and Iraq Campaigns, two campaign stars, a Bronze Star, the Army Commendation Medal with V, Purple Heart fourth award, parachutist badge and good conduct medal. He has completed Infantryman school and Ranger school.